click.to is now on Wikipedia! We’ve had the the Wikipedia action with click.to since the beginning, but now we actually have an article. I know many of you don’t think it’s such a big deal to get a Wikipedia article, but as most of you know, it is very important. It helps validate that your company product or topic is valid and newsworthy, and as a small startup, that means a lot. I don’t know if any of you have ever written a Wiki article before, but its not easy. 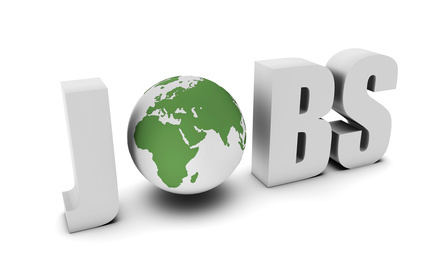 There are thousands of editors that would like to put their ‘two cents in’ and help you change things. That can turn into a lot of work, but it is also the reason that Wikipedia is great. Very helpful editors and an extensive community of authors that are always there to help a newcomer. The English click.to article has yet to be reviewed, but you can see it if you do a search (or just click on the link). So, if anyone is a great editor on Wikipedia and would like to help make our article better, It would be greatly appreciated! For our German speaking users, we have an article for you too. 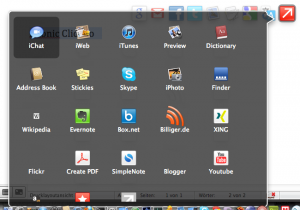 Thanks for all the help thus far with the German click.to article! 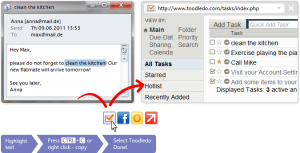 Toodledo is a program that can integrate all of your little bits and snippets (or in my case, random thoughts) into one place, and remind you of what’s ahead and what’s important. I wrote last week about Twick.it and how it would be a great new partner for us, and they are! I updated my click.to program today and was surprised to see quite a few changes. First, is that Twick.it is there, but I was surprised to see that the QuickView portion of the program works so well. (Not that I doubted our programmers). It makes click.to even faster! That’s the ultimate goal, right? Second, There were a couple of other programs hidden, that we haven’t even announced yet! (I’m sure I’ll be writing about them shortly) It’s like being behind the scenes of a movie production, you know how it looks when they shoot, but the final product in the theatres still impresses you. 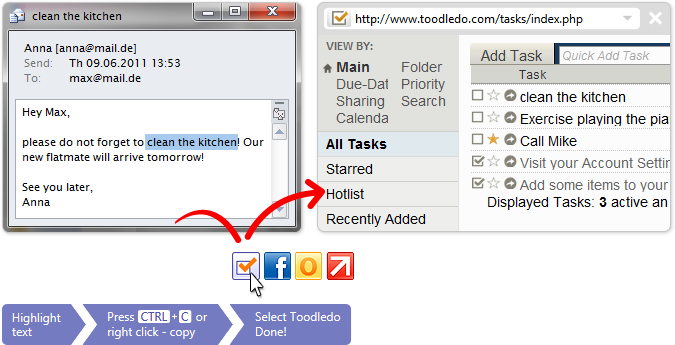 I’m very impressed with the new version, but I’ll admit that I’m a little biased, so please let me know what you think. 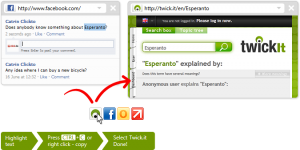 The idea behind Twick.it is to help users find information in a condensed format. Think, Twitter and Wikipedia combined. 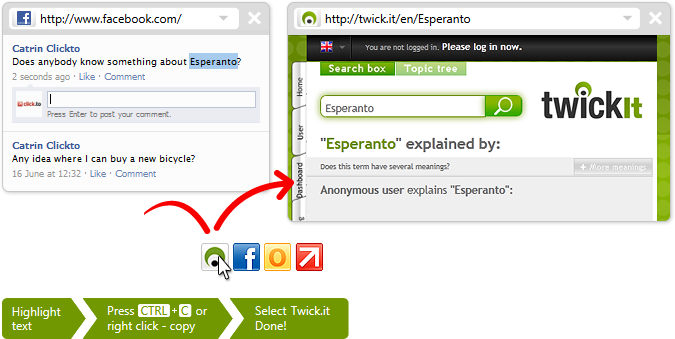 Twick.it entries are entered from a word or article into the 140 character twitter format. 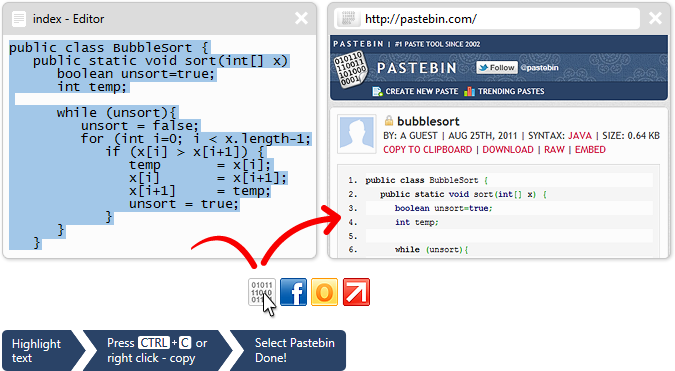 We’ve teamed up with Pastebin.com to help our heavy users (Aka my boss) gain access to the programs that they use most! 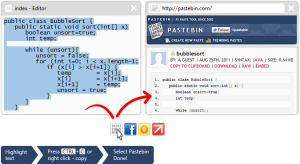 Pastebin is an online location to store all of your program snippets and share them with other users, or keep them private for future reference. I woke up this morning (along with the rest of Europe) to the shocking news of Steve Jobs’ departure from Apple. It’s quite a shock to know that a man of 56 that has changed the way people use computers, is already past his prime. I admire the fact that Steve took the decision to resign instead of being forced out like many other CEOs today. We are very happy to announce that the new Apple version of Click.to will be available soon! Its very humbling for us that so many people were willing to help test our Alpha version and help us (in a very short time) to make the new version better! Google announced yesterday that they have released Instant Pages. 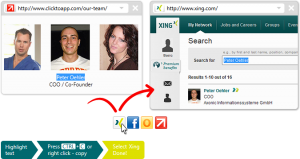 It works with google chrome to instantly add web pages that appear in the search query. The program is available for Web developers today, and should be released in a Chrome Beta version soon.